Who does that’s available?🤔 silly statement!! He’s the best possible player to make the Bills better at that position. There is no QB in the draft that you can say is going to be better than him. A couple of them may be but right now they don’t have a NFL resume. Nick Foles is not a top 5 QB but should be in the discussion of the lower end of top 10 (8th, 9th, or 10th). The Bills can trade for him using one of our firsts and maybe a lower pick or a 2019 4th we received from the Chiefs for Reggie Ragland. That way we will have a solid QB with money next year to resign him if he plays well. You would still have pick 21, 53, 56, 65, and 95 to help to solidify our defense and add a OL or WR. And although I liked TT, Foles would be a solid upgrade to a important position to a team that made the playoffs last year. What's silly is arguing against a true statement. What QB do you want? I'm looking toward the draft for Rosen, Darnold, or Mayfield. Except these conversations have been had. The Bills know the price to get up to get their guy. The Bills have loaded up their war chest to do just that. It would be SHOCKING if the Bills did anything else at this point to address QB. They aren't going to overpay for Foles’ hot streak. It isn’t like Jimmy G where he played great as soon as the chance presented itself. Foles has a pretty long resume and it is wildly inconsistent. The playoffs last year and the one year with Kelly were great. He’s been pretty much bad the rest of the time. I have no interest in spending on that resume. Give me Rosen or Baker or Darnold and roll. Try to get top end QB play not good enough QB play. It’s the exact reason that you pass on Cousins too. 21,22, 56 and next year’s 2 to go into the top 5. The only way that trade works is if at least two of the Fab 4 appear to be sliding down below pick 6 and maybe down to 14 or 15. In that case more teams will choose to conserve picks for a player who might be just slightly lesser in their minds than one who may go 2-4. With some of the post senior season luster gone and a chance for teams to poke and prod at the combine it is looking like there is a better chance that the top QB's will not cluster at the top of the draft. I would only give up a 4th rd pick for Foles. Whatever team trades for him will also be giving him a new contract in the 14 to 16 mil a year range. absolutely no way this can be answered. nobody, scouts, GMs, family members, you, I, nobody knows what these kids will do in the league. Kirby, I don't think it's as definite as that. 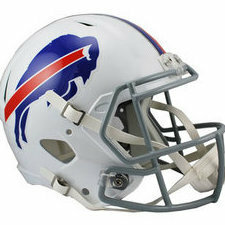 The Bills likely have an idea what the price is, but at this point any draft trade-ups are highly dependent on what the trade partner 1) does in FA 2) concludes after further evaluation of the top prospects that interest them 3) gets offered by other teams - as well as what the Bills conclude after further evaluation of the top prospects they'd trade for, and the ones they could possibly get by staying put. It's all conditional and speculative at this point for the teams - it has to be. I see Foles differently, but that's because 1) he interests me 2) I live in St Louis. Foles played well in KC when he got the call. I wouldn't count his year with the Rams against him - or against Case Keenum. You had to look at it "up close and personal" to see how bad it was. The Rams "wonderful" OC the Foles/Keenum years is now our TE coach. Since he's the dude who benched Foles, he possibly has an opinion and some influence? The Foles conundrum is what changed for him between 2013 and 2014. I have my ideas, but only from a 10,000 ft view. Nice. Let's hold them to your Foles standard. Copy and paste me some data that proves they will play "consistently at a Super Bowl MVP level", your knock on Foles earlier, and I'll buy your "logic". Good one. Buy it or not, matters not to me. Ah yes! Journeyman dreams. Carry on. But then again Taylor was traded for basically a 2nd rd pick so you might think Philly is looking for a 1st or 2nd rd pick. The big difference between Foles and Taylor is Foles is a much better QB but your going to need to pay him like a super bowl MVP. Good one. Buy or not, matter not to me. Ah yes! Journeyman dreams. Carry on. That's what I thought. Thanks for the logic lesson. Your logic in acquiring Foles is what? He'll play consistently great despite a career that says otherwise. Laughable. Daboll ran RPO a good bit this past season. Now if Blake can get a team to the championship game how much should be given up? No way the Bills trade Taylor then draft basically the same skill set. When the Bills traded Taylor I knew Jackson was crossed off their QB board. That is a lot of success in two different offenses multiple years apart. I am not saying we need Foles. But, he is not just a journeyman QB to me. He is still young and has upside too. But, don't get me wrong, he is not my first pick. That makes him unique compared to some of the other available QB's. The logic is that no rookie has even proven a thing in the NFL, much less win a SB. And to top it off, the amount of draft capital it would take to get one of the top QB prospects would basically prevent them from improving the team in other areas.